210 Home Base Iowa hires in Greene, Howard, Clarke and Floyd counties. SCRANTON, Iowa - Since mid August, the Iowa Business Council has recorded 210 Home Base Iowa hires in Greene, Howard, Clarke and Floyd counties. Greene County has been leading the way as the first to adopt the initiative in March of 2014, and is already reaping the benefits of the program originated by Gov. Terry Branstad. "This was an initiative the Governor had started and there were people at the state level working on it," said Jim Ober, an executive member of the Greene County Development Corporation Board and Vice President of Operations at Scranton Manufacturing. "We thought this was a great opportunity, so we kind of pushed things along. Scranton Manufacturing has over 25 veterans on staff between our Carroll and Scranton locations, and this is a way to give back to them. Everybody benefits from this program." Ober explained that the current rural trend is declining populations, which further contributes to shortages in skilled labor. "Veterans are looking for good jobs in good communities. They are looking for good schools, daycares and the other support mechanisms that they need," Ober said. "We do it because it is the right thing to do, and our success has made us the model for other counties. That is exciting to see." Home Base Iowa businesses, the counties and some cities have put together incentive packages for veterans to relocate to their communities. In Greene County, benefits available to veterans include elimination of closing costs on VA loans, up to $2,000 in relocation support, a 100% three year property tax abatement and a central housing site on the Chamber of Commerce website. In addition, individual businesses may add to these incentives. " We also do a voucher program," Ober said. "If a family wants to come and visit our community and our workplace, they can use the vouchers to cover some of their expenses related to meals, hotels, etc. This is something that is unique to Greene County." Greene County Development Corporation Joint Executive Director, Ken Paxton worked diligently to partner with the state on behalf of Greene County. "We are proud to become the first Home Base Iowa Community in the state," he said. "Veterans from all across the nation sacrifice so much each day to protect our freedoms. It is without hesitation that we give back to them in this small, but significant way." For some veterans, however, it isn't as much about what incentives are offered, it is more about the fact that they are offered. Dan Currier grew up in Washington state, but had family in Jefferson. He served in the Navy, having enlisted and headed off to A school only two-days after his high- school graduation in 1991. He spent four years in the service, including a five month stint underwater on a submarine in the Mediterranean sea. After getting out in 1995, he returned to Washington, but found it difficult to find satisfying work. Currier worked at a bakery in Washington for three years after leaving the service. At that time, he and his family moved back to Jefferson, where they stayed for 14 years before relocating to Waterloo. "It was congested and full of violence," Currier said. "We heard gunshots at least every week, and our house was shot at randomly. The final straw was when our 10-year-old son found a loaded gun in the front yard. We were talking about moving before that, but that made it definite." Currier, his wife and their three children remaining at home moved back to the area and purchased a home in Churdan. They have loved it ever since. 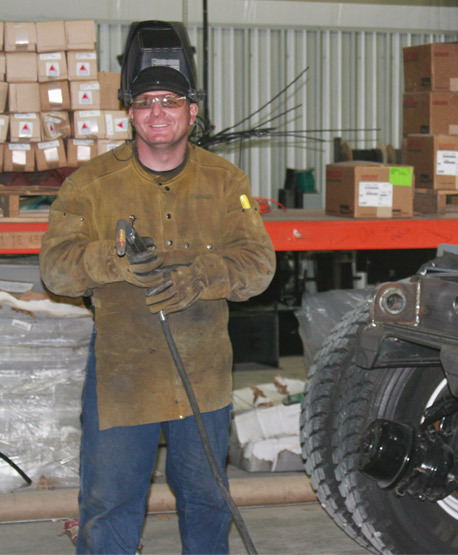 Now, employed as a welder for New Way® Trucks, a division of Scranton Manufacturing, Currier and his family opted to forego drawing on the Home Base Iowa benefits, but he is extremely grateful that there is a program for veterans. "It drew me here," Currier said of the Home Base Iowa initiative, "but I realized we didn't need anything, so we just went about the process of moving. If this would have been available when I got out, I would definitely have been here sooner. This can get people started and give them a jump on life, and it makes me feel good that Greene County really cares. They are saying, 'You are a veteran. We respect you. We are glad you are here, and thank you for your service.'" Currently, there are over 50 Home Base Iowa Businesses in Green, Floyd, Clarke and Howard counties. For more information on the Home Base Iowa initiative, log on to their website at www.homebaseiowa.org or at 855.9hb.iowa (855.942.4692).